I walk out of the airport in a far away country and get stunned by the warm moist wall of air rushing against me. On a taxi ride towards bustling Bangkok I receive million new noises, smells and visions. It creates an overwhelming feeling of adventure. I have never been here before. I’m thrilled to see more. This was the first powerful experience of traveling outside of my own continent. It was in 2011 on my first trip to Thailand, one month. After that I have traveled for months around Asia in countries like Philippines, Indonesia, China, Myanmar, India, Nepal, Vietnam and so on. I’ve also visited in few countries of Africa and perhaps one third of countries in Europe (it could be said I have seen just a scratch of what the world is). I am from Finland. According to UN report it's the happiest country on earth. I have never felt poverty or lack of material needs. I haven't felt fear of dropping out of society because Finland has very advanced social security system. Even though people are rich in global terms, there seems to be great pressure to perform and accomplish in society. People compete for better jobs, better places to live and better lifestyle. All of our our basic needs are filled but pressure of succeeding creates anxiety. For people like me it leaves strange dullness hanging in air. What is life and is this it? Who is rich actually? For me traveling used to be a way to escape my own reality and expectations back home. Freedom from everything. For my surprise it has given me perspective to understand that my own reality is small, limited and expectations we face here are trivial. I learned that worries that I used to have are not existential. In fact they are ridiculous first world problems. For a privileged western boy like me, it is very healthy to see real challenges people face. Learning to be satisfied in what you have is not an easy task. Everyone in Finland knows that things are well home and worse in developing countries. What we don’t know without traveling and facing people from different cultures is that things are not as sad as they seem through media nor they aren't as glistening as it seems through social media filters. News tend to give very negative image of world because they focus in extreme phenomenons such as wars, conflicts, natural disasters and terrorism. They tell what is exceptional but don’t tell what life is like. As people don’t have personal first hand experience of the world, it leaves them with only assumptions created by others. I was surprised how safe I felt abroad although everyone warned me about dangers and threats I might encounter when I first time left Finland with backpack on my shoulders. Trusting people who are not your own “tribe” has something about life as it's purest. Sleeping in friendly stranger’s home, asking direction up at a Himalayan trail, or trusting driver of a pick up truck to take you back to city at nighttime in Mandalay. I believe that some things cannot be learned without experiencing them personally. People’s friendliness, ordinariness, sense of humor, faiths, love and loyalty to family are universal. I couldn’t have learned that humans are humans everywhere without interacting with lots of them. When I see masses of people in the streets of Ho Chi Minh, it clarifies me: I'm one of billions. Being born in a rich country is privileged by chance but I’m just an individual among others. These kind of experiences abroad make people who travel globalists. The most important thing that traveling has taught me is solidarity towards all humans. We can get along, we are getting along and we must get along. Text for photo: Most of my trips I have done with my wife. From her I have learned compassion. HAY UN LUGAR DONDE LAS AVES REINAN COMO DUENAS ETERNAS DE LA LAGUNA…ELLAS NO PIDEN PERMISO NO PIDEN ABRIGO NO PIDEN COMIDA…..NO NECESITAN NADA DE NOSOTROS…NOS PERMITEN COMPARTIR SU MUNDO DESDE EL BORDE DE ANSENUZA SOLO MIRANDO LA MAJESTUOSA BELLEZA DE SUS VUELOS O LA ETERNA QUIETUD DEL AGUA…ALLI DONDE LA TIERRA Y EL CIELO PARECEN NO TENER DIFERENCIAS,ALLI DONDE DESAPARECE EL HORIZONTE Y LO TERRENO Y CELESTIAL SON UNA SOLA COSA…. Email from someone special in my life. Thanks Maggie, love. Words to my friend Agu. You were right, it is worth it. Before I was pregnant myself, I never gave much thought to it. I kind of just assumed that pregnancy was the same for everyone; you get sick, you get fatter, the baby is born, the end. Call it naive if you want but that was the extent of my thought process when it came to being pregnant. When I actually did become pregnant, it was different. Firstly, I didn’t really get sick. At one point, when I would have been unknowingly more or less three weeks pregnant, I ate sushi and it didn’t stay down. I only ever threw up once after that and I’m convinced it was due to realising I was pregnant, rather than actually being pregnant. The “worst” thing I’ve had to deal with so far was motion sickness during the first trimester. I couldn’t stay in the car for more than 30 minutes or at most, I’d feel real nauseas the rest of the day. But this was an easy fix: don’t take long car rides. Check. At the time of writing this, I’m 26 weeks. My little boy moves a lot, he’s growing perfectly and I’m getting more sleep than I’ve had in the past three years combined. I’ll have to find some wood to touch but, pregnancy for me is pretty darn cruisey compared to some of the experiences of others. I’ve been blessed. Not just blessed health wise, but people have been so incredibly kind and giving towards me, so much so that I really haven’t had to pay for anything so far and I have acquired just about everything I’ll need for the first few months. I haven’t had to stress about a lot of things, courtesy of this kindness. Life has just sort of continued on like normal…Up until the last three weeks that is. And only then, did I begin to realise that pregnancy is not so simple as to thinking it’s just about the physical process. Pregnancy comes with a massive mental challenge too. These last few weeks I’ve been a little unsettled. I’ve worried about finances and maintaining a job now and after he arrives. I’ve found myself suddenly over thinking about parenthood because I usually under think a lot of things related to it. “Just go with the flow of your soul”, my heart usually says. But my head sometimes tries to hastily whisper: “you need to think more, research more, be more like this and do more of that.” Sometimes, it makes me feel lost. 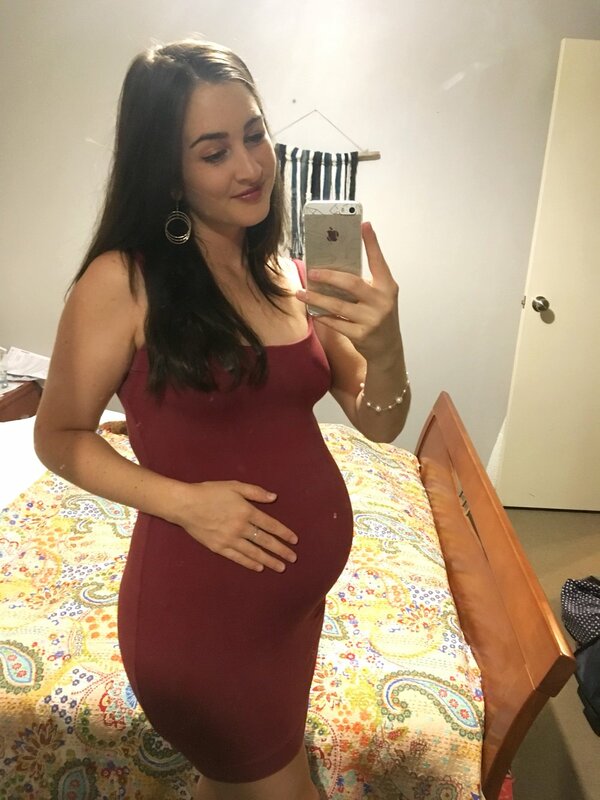 In fact, I’ve feel more lost trying to plan my life out now preparing for a little one, than I ever have over the last three years of my spontaneous free-girl life. I’ve had occassions where I’ve booked a random ticket, woken up not knowing where I’d be at the end of the day, being somewhere new and alone with a backpack and without a plan. But never have I felt more alone and lost than what I’ve been feeling recently. It’s a lot of pressure, raising a child. You dream of everything good for them, and you wonder how you’ll manage to open all the doors for them. You realise, that even with all the people supporting you, providing for you and blessing you through this experience, this child depends on you. I never imagined pregnancy to come with all these feelings and thought provoking moments. Heck to be real honest, some days, it even makes me feel scared. I’m a strong person, but at times I doubt myself. Will I be enough? It was on a day I found myself too lost to be anywhere but with my head on the pillow, whispering an apology to my son for not knowing how to be stronger. I lay there trying to cease the flow of hot tears - the kind of tears you know are from somewhere deep inside a part of you that you haven’t quite figured out yet but you are aware exists in all its rawness – when I felt him move boldly under my shirt. I breathed and realised; you were right. It’s all worth it. You’ll never know what being pregnant is like directly for yourself, but you sure knew the right thing to say, even when at the time it felt irrelevant to our spontaneous, wild lifestyles. I remember you declaring that when it comes to being gifted a child, giving up is not an option, but growing and getting through is a necessity worth it all. Children are just…worth it. You told me it wouldn’t be easy, but you assured me it would be possible.